COPE Councilor Ellen Woodsworth committed today to slow gentrification in the Downtown Eastside, a process that is pushing out local residents through unaffordable rent and rising food costs. 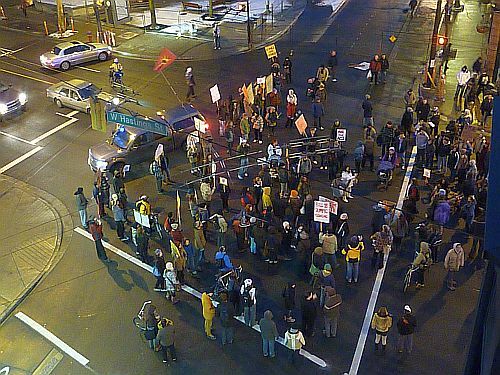 In front of the controversial Pantages Theatre site, Woodsworth announced COPE’s plan to ensure property in the Downtown Eastside is devoted to affordable housing for the low-income community. COPE committed to calling for a condominium development moratorium in the Downtown Eastside until sufficient low-income housing is in place. COPE will also strengthen the anti-conversion by-law by defining ‘affordability’ as being affordable to those on Government Assistance. This will ensure that residents of the area are not forced to leave their homes because of increasing rent. Woodsworth highlighted the demands of local community groups, including the resident-based Downtown Eastside Neighbourhood Council, calling on the City of Vancouver to identify 10 locations to be designated as future sites for low-income housing. COPE also commits to providing greater security and safety for residents of Single Occupancy (SRO) hotels. “Our city staff need more resources to help enforce standards of maintenance by-laws. This is crucial in order to protect our city’s most vulnerable from absentee or neglectful land owners,” added Woodsworth. COPE also set a target of creating 1000 affordable housing units in Vancouver every year. “Housing is a top priority for our city, and residents can count on COPE to create a Vancouver for everyone with safe, secure, affordable housing,” said Woodsworth. While calling for a national housing strategy and for increased provincial support for affordable and supportive housing units, COPE wants the City to play a leadership role in making the creation of new housing a reality. 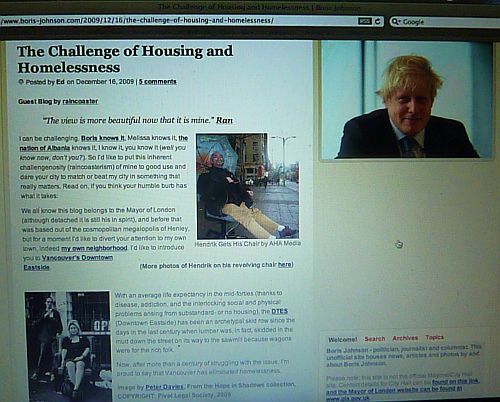 AHA MEDIA from Vancouver Downtown Eastside is very proud to be featured on the Blog site of the Mayor of London, England – Boris Johnson! AHA MEDIA is very proud to be featured on Blog site of the Mayor of London – Boris Johnson! Many thanks to our great mentor @Raincoaster for featuring AHA MEDIA and what we do in the Vancouver Downtown Eastside! ” We all know this blog belongs to the Mayor of London (although detached it is still his in spirit), and before that was based out of the cosmopolitan megalopolis of Henley, but for a moment I’d like to divert your attention to my own town, indeed my own neighborhood. 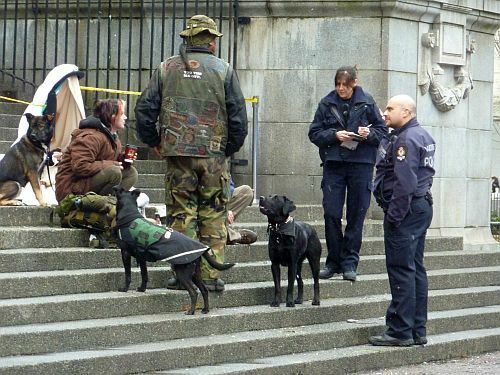 I’d like to introduce you to Vancouver’s Downtown Eastside. @Raincoaster writes ” With an average life expectancy in the mid-forties (thanks to disease, addiction, and the interlocking social and physical problems arising from substandard- or no housing), the DTES (Downtown Eastside) has been an archetypal skid row since the days in the last century when lumber was, in fact, skidded in the mud down the street on its way to the sawmill because wagons were for the rich folk. Now, after more than a century of struggling with the issue, I’m proud to say that Vancouver has eliminated homelessness. We anticipate increased life expectancy (as much as thirty years for DTES residents), a significant drop in crime (particularly violent crime), and an estimated $5000 per person “housing dividend,” reflecting the difference in social service expenditures between the housed and the homeless. If a Canadian may toot her city’s own horn, this is truly an amazing accomplishment and Mayor Gregor (Robertson), Premier Gordon Campbell, City Hall, social service agencies, advocacy groups and officials at all levels should be very, very proud. I salute them. Who can even imagine how it must feel to know, unequivocally, that you’ve changed the world for the better. Vancouver’s housing crisis is finally over. Today Ray Solda, Vancouver’s last homeless person, moved into his room in the Kansas Hotel, a new social housing building funded by the provincial government. Government officials and Canadians everywhere today are celebrating the end of homelessness in Vancouver, a city that has struggled with a homelessness crisis for years. Today’s announcement is the result of a number of key investments made by the provincial government to build social and supportive housing as part of their visionary comprehensive housing strategy. Despite the up-front costs, government and experts alike are confident that ending homelessness in Vancouver will actually save money over the long term. Once again: simply amazing. This is an incredible example to the rest of the world. So you tell me: does London have what it takes? “The ‘Assistance’ to Shelter Act Must Be Stopped! use force on homeless people to compel them into shelters. In this video, Roy ( who declined to be filmed ) speaks about the horrible living conditions which include bed bugs, rats and cockroaches that he and his partner face. What is even more surprising is how his rent jumped $65 dollars extra and how he lives on just $100 a month for support!! This was filmed by April Smith of AHA MEDIA on a Nokia N95 mobile cameraphone. April is passionate and skilled in making Nokia films by exploring mobile media production through the camera lens of a cellphone. For a better quality version of this video, please DM April Smith @AprilFilms on Twitter. In this video, Hendrik Beune introduces Upwords Magazine written by DTES Commnity folks about issues regarding the area from poverty, addiction and homeless issues. Hendrik and J Hock’s thoughts on homelessness in Gastown and inviting J-Hock to be part of AHA MEDIA!! In this video, Hendrik Beune, Director of AHA MEDIA with J-Hock speak about a fancy furniture store in Gastown where Storeyeum used to be. They recall that Audrey Laferriere, a well known DTES campaigner advocated for 2 years to convert Storeyeum, which was a vacant city-owned building to be turned into a homeless shelter which didn’t happen. On Sunday April 4th, thousands of Vancouver folks marched in solidarity to support the Grand March for Housing. which demand immediate government action to end homelessness, build social housing, protect rental housing and raise welfare and minimum rage rates. The Fearless Mobile City project is a two-way social media system for marginalized residents and artists of Vancouver’s Downtown Eastside (DTES). It is an interactive communication system that uses Mobile Muse 3’s technology platform, a free wireless mesh network, distribution and training with mobile handsets, and live screens in public spaces. Participate in Fearless City at live events in and around our inner-city neighbourhood to create community generated media while confronting the digital divide. From engaging with the public through Fearless projects, we developed our own unique way of doing event coverage and citizen journalism as we build our own AHA MEDIA website. We at AHA MEDIA are glad for the opportunities from Fearless City that help pique our interest into mobile phone technology and all the ways it has helped our Downtown Eastside Community. In another city – Washington D.C. an article in the Washington Post describes how their homeless use cellphones, blogs and email to stay on top. It’s another sign of a society in transition by way of technology, as businesses shed physical addresses for cyberspace and homeless people can establish an online presence and chase opportunities digitally. Advocates who work with the District’s homeless estimate that 30 percent to 45 percent of the people they help have cellphones. A smaller number have e-mail accounts, and some blog to chronicle their lives on the streets. When Laura Zeilinger, deputy director of program operations for the D.C. Department of Human Services, conducted housing assessments of a couple of thousand people living on city streets last summer, she was surprised by how many gave her cellphone numbers and e-mail addresses. “Phones are really a lifeline for many people,” said Adam Rocap, director of social services at Miriam’s Kitchen, a nonprofit drop-in center for the homeless. 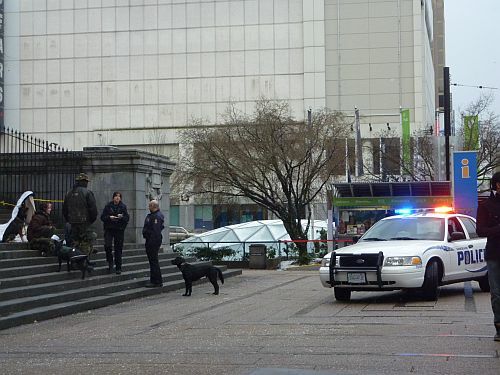 During a string of attacks against homeless people sleeping downtown in the fall, two victims called 911 for help after they were assaulted, he said.